This tasty soft and chewy supplement is tailored with a balance of nutrients. With Vitamin C and Zinc to support immune defences, these nutrients support the health of seven to eleven year olds helping them be ready to tackle the day. 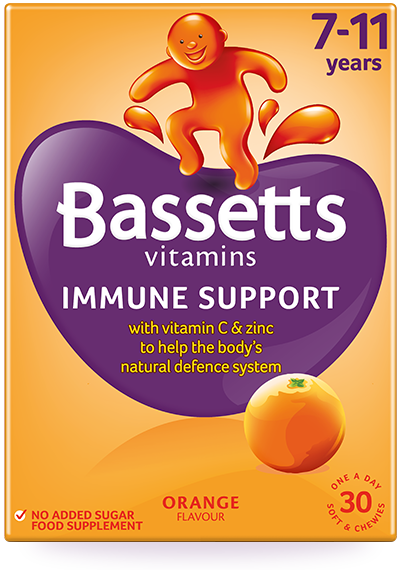 Vitamin C & Zinc help support the immune system. Vitamin C helps reduce tiredness & fatigue & contributes to the release of energy from food. Vitamin C helps support the working of the nervous system. Sweeteners (Maltitol syrup, Sorbitol, Sucralose), Vitamin C, Gelatine (Bovine), Zinc, Orange flavouring, Glazing agent [Vegetable oil (Coconut oil, Palm kernel oil, Sunflower oil), Carnauba wax], Colour (Mixed carotenes). Contains naturally occurring sugars. Not suitable for children under the age of 7.